Whatever your inquiries are about asthma and respiratory allergies, our team of expert Certified Respiratory Educators (CREs) can provide you with personalized support and advice. 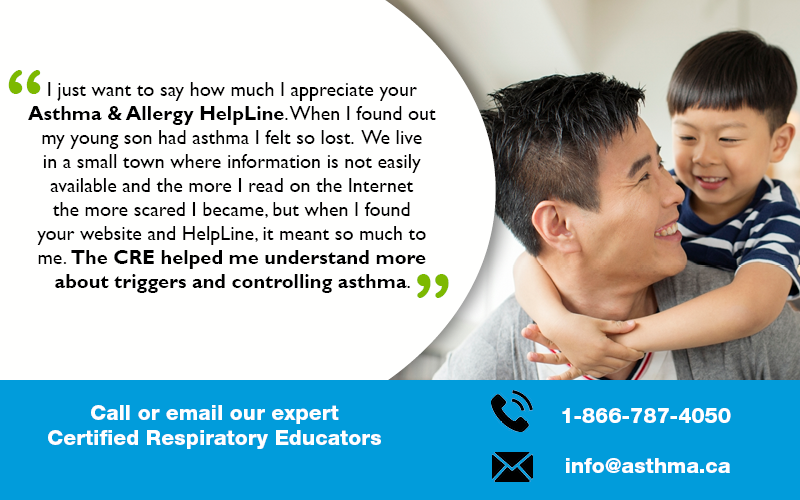 Call 1-866-787-4050 or email info@asthma.ca to connect with a CRE. Our Asthma & Allergy HelpLine is a FREE call-back or email service available to all Canadians. Whether you have asthma and other respiratory allergies or are a caregiver, our team of expert CREs can support you. How can the Asthma & Allergy HelpLine help me? Don’t hesitate to ask your most pressing questions about asthma and allergies. Our CREs are here to help you with proper care and management so that you can live your life symptom-free. You can typically expect a response from our CREs within 2 business days. They will respond back to you through your preferred contact method (phone or email). Please note that this is not an emergency service. If you are experiencing an asthma attack or another emergency right now, please call 911 for an ambulance. If you are having immediate difficulties with your asthma, please contact your healthcare provider. * You can typically expect a response within 48-hours. This is not an emergency line. In case of an emergency or an asthma attack, please go to the ER or call 911.